This is a Double Vision made by Advanced Transportation Products (ATP). 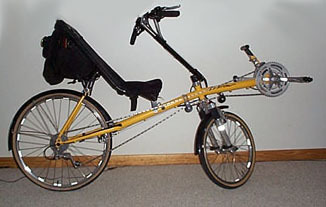 It is a short wheelbase (SWB) underseat steering (USS) recumbent tandem. We bought one used in 1998. We rode it on two tours, but quickly found that we didn't have the time to ride three tandems. The bike is incredibly comfortable, but we like to ride agressively and this tandem's handling wasn't up to it. We sold it in the spring of 1999. If you have one of these tandems, see important inspection information on ATP's site! This is Alan's single recumbent, also made by ATP. It is a Vision R-44 SWB/OSS (over seat steering). This bike has a front suspension fork and the frame was redesigned for 1999. Vision is a great company to deal with. They exchanged frames more than a year after I bought my 1998 suspended R-44 since I wasn't happy with the handling of that bike. This frame was built up with the parts from the suspended R-44 (below). There is also a review of this bike on this site. My previous R-44 was a 1998 model with front & rear suspension. This picture at left is from ATP's web site and shows the bike set up with USS. Several reviews of this bike are linked from the previous page. 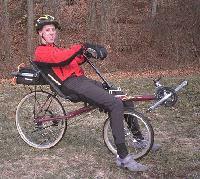 This picture of Alan riding his first recumbent, an ATP Vision R-40 SWB/OSS, was taken on a WHIRL ride in January, 1998 in Rock Creek Park. This bike was a 1996 Vision R-40 which is similar to the R-44 but without the suspension. The R-40 has a larger diameter, heavier frame, and less expensive components. This model can be converted to LWB (long wheel base) and can be equipped with a 20" front wheel (as pictured here) or a 16" front wheel (for shorter riders). 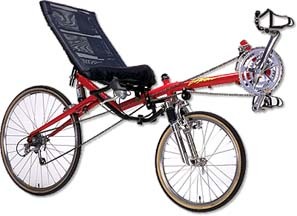 Dawn's first recumbent was a Linear Mach III compact long wheel base (CLWB). We sold it because it didn't quite fit her right. (Not many recumbents are well suited to a 5'00" rider.) She later got a Rans Tailwind, which was a great bike and was adjustable enough to fit either of us. The Tailwind is sometimes described as a LWB, but seems to actually fall somewhere between Compact LWB and LWB, having the characteristics of both. The Tailwind is also one of the least expensive recumbents on the market, and delivers much more "bike for the buck" than a lot of others. 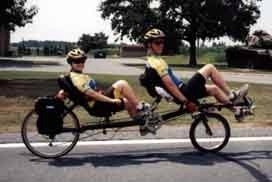 Dawn eventually decided that she preferred riding her Terry upright bike over the recumbent, so we sold the Tailwind in 2000.